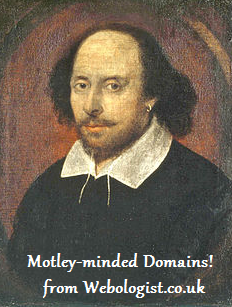 Domain Name Ideas – Use Shakespeare’s English Language! If you are trying to think of a brandable domain name for your online enterprise then you can now take inspiration from the mastery works of William Shakespeare. However, this list was originally intended as a way to create amusing new insults. But, many of the words here have eluded the domainer types (domain name speculators) over the years so are still available. For an insult you combine a word from each column, e.g., you Cockered dizzy-eyed harpy! But, dizzy-eyed.com is not currently registered. So have some fen-sucked.com fun and start a new brandable web business based on the bard’s masterful work. Or just hurl insults at your friends on Facebook. I love these suggestions! It adds a lot of fun into the process of domain name selection. This is actually a very creatively stimulating exercise. Using these words helps us tap a different area of the brain to produce unique ideas for domain names. Great work on this!